This is an emergency. On December 9th, we must mobilise in massive numbers – say no to the far right, and say no to Brexit. Join the Facebook event here. Share and invite everyone you know. On December 9th, the day before parliament votes on Theresa May’s deal, the far right will march on London under the banner of “Brexit Betrayal”. We will mobilise, in massive numbers, to combat their message of hate and division. And we will demand a serious alternative: a society that works for everyone, and a final say for the people on Brexit. In the face of this moment, it is not enough to simply oppose racism in the abstract. 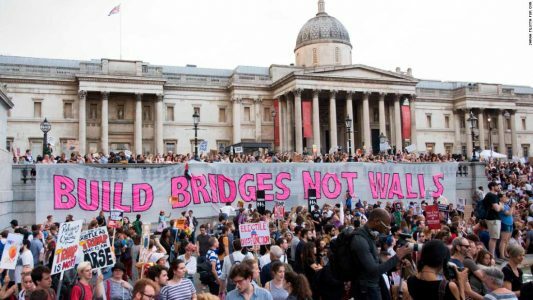 Brexit is being used to attack migrants, end free movement, deregulate the economy, divide communities and legitimise racism in the political mainstream. It is driven at its core by the British wing of a movement that includes Donald Trump, Jair Bolsonaro, Marine Le Pen and Geert Wilders, among others. Tommy Robinson is not just using Brexit as a tool to attract followers. Brexit has from its earliest days been driven by the far right, and the far right will benefit from it for decades to come unless we defeat it and the conditions on which it feeds. The far right is growing because the economic and political system has failed us. We need decent homes and jobs, we need a transformation of the economy that gives people control over their destinies.